Southwind Park, Springfield's most inclusive attraction, sets a new national standard not just for accessibility, but also for environmental excellence. 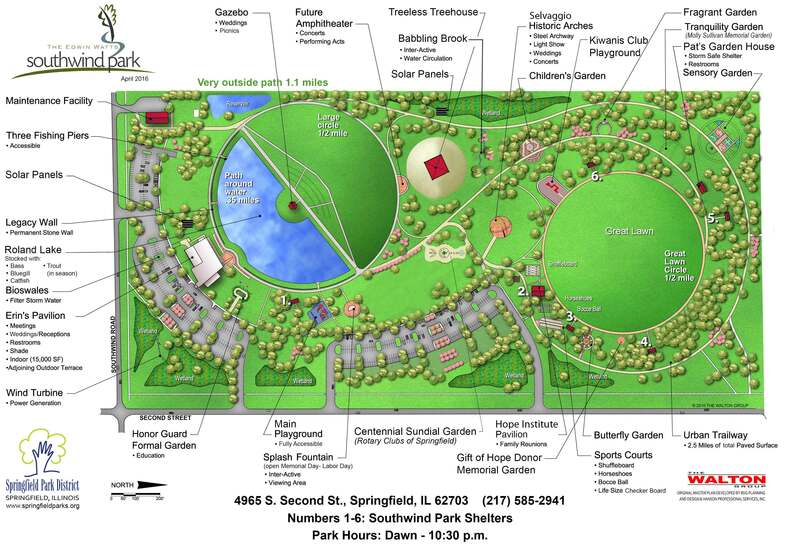 Every area and feature of the 80-acre park exceeds ADA accessibility requirements. Erin's Pavilion is a Platinum LEED certified building. Other eco-friendly features include wetlands, a wind turbine, solar panels and a geothermal system. One of the most compelling features of Southwind Park is its complete accessibility for all ages and abilities with special emphasis and attention given to those with physical and cognitive disabilities. It provides a new dimension of inclusion for all people "without boundaries" in full compliance with the Americans with Disabilities Act. Southwind Park is an all-people park, serving cognitive, emotional, physical and social needs in a diverse, safe and fun setting without physical and social barriers. Three completely accessible fishing piers on the lake allow anglers to try their luck at catching bluegill, bass and catfish. The gazebo offers a panoramic view of the lake and Erin's Pavilion, all surrounded by beautiful native landscaping. It is an area for tranquil reflection and quiet conversation. One of the city's largest playgrounds is barrier-free and includes accessible swings and outdoor musical instruments. For safety and comfort, there is pour-in play surface. Five picnic shelters, equipped with ceiling fans and electric outlets, are scattered throughout the park. A large familiy picnic shelter is located near the great lawn and sports courts. Bocce ball, horseshoe pits and shuffleboard courts offer group fun at the park. Individual and league play is available. This 8-acre grassy area is ideal for kite flying, Frisbee and just hanging out with friends and family. One unique feature of Southwind Park is its five sensory gardens. The Enabling Garden has raised planters for seated gardening. The Tranquility Garden, for persons with Alzheimer's or dementia, has seating areas and a grove of white birches. The Fragrant Garden features a waterfall and sensory plants in easy reach. The Children's Garden includes a vegetable garden, native plant area, bird attracting garden and many different paths and whimsical items. The Butterfly Garden has interpretive signage, seating and a water feature. Navigating the park is easy with a 2 1/2 mile concrete trail that has built-in directional guides and a color-coded wayfinding system for individuals with cognitive disabilities. The park's exclusively designed tram is accessible and carries up to 8 people, providing either a complete tour or a ride to a specific park location. Southwind Park is a multi-million dollar all accessible park. It was named after Edwin Watts who was a lifelong resident in Sangamon County. He used the property for agriculture and died in 1913. The 80 acres of land was passed down through his family and was finally donated to the park district in 2004. The park project was funded through numerous funding methods such as grants, fundraising, and donations.